The legend of Ostara, as with many others, is shrouded in mystery and contradiction. The Anglo Saxon’s didn’t have the benefit of social media or blogs to spread the word – and how lucky they were – so much of this particular legend is hand-me-down folk lore. However, many do agree that the Anglo Saxons saw Ostara (Eostre) as the goddess of spring, moon and dawn and that she had a hare as her sacred companion. At that time, many also believed that hares laid eggs which is why today some believe Easter’s origins date back to this Goddess and her egg laying companion. Whatever the truth, we love the romance of the legend. More importantly, we love the fact that spring is something to celebrate and raise a glass to. 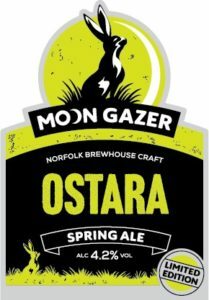 Our new ale – Moon Gazer Ostara – will capture the essence of spring welcoming in a golden new age, and also doff its hat to the resurrection links to Easter as well. If that’s all a bit twee for you, just relax in the knowledge that it’s a great new addition to our range. Well, one of the most popular one-off ales which we ever brewed was Chevalier Gold, a beer which used two resurrected ingredients – Chevalier Malt and a British hop going by the name of Ernest. By way of a quick reminder, Chevalier is a heritage malt, first grown in 1824 in Suffolk from grain selected by Dr John Chevalier. The malt went on to become established the world over as one of the leading brewing malts. However, it was last grown commercially in the 1930s – that is until a couple of years ago when, thanks to collaboration with The John Innis Centre in Norwich and Crisp Maltings, the malt was slowly resurrected. The heritage malt imparts a robust, dominant malt flavour and the beer needs to be quite heavily hopped to balance the malt character. That’s where Ernest comes in. This hop variety was first selected in 1921 and eventually trialled at Wye College in Kent in 1957 and 1958. However, the brewers at the time rejected it as been ‘too American’, far too aromatic and tasty for their British bitters. Thankfully times have changed and Ernest it is now grown commercially for Charles Faram and is admired for its New World flavours. That said, don’t think we have just taken the easy route and brewed a weaker version of Chevelier Gold. No, we wanted to impart some new fresh flavours too. The heritage malt will be blended with Maris Otter, while the hop’s citrus and orange notes will be hopefully enhanced with a dash of peels from both of those fruits – with some invert sugar adding to the mouthfeel and sweetness of the brew. The result – a light golden ale – light with a robust but balanced bitterness and a lemon and orange citrus finish refreshingly spring like. The beer will be heading out to pubs from the 4th April, so do please look out for it and enjoy.